Developer Quote: "iWatermark is the essential Watermarking App for Professionals, Business and Personal Use. Easily, secure, protect your photos/art with a visible text or graphic or QR watermark. Once added to a photo this visible watermark displays your creation and ownership." ♦ Click on the watermark to move it anywhere on the page. ♦ Use pinch/zoom to expand/contract the size of the watermark. ♦ Use two fingers at once to rotate the watermark to any angle. ♦ Easily adjust the watermarks scale, opacity, font, color and angle. ♦ Create your own text or graphic watermarks or select from the included example watermarks (both text and graphics). ♦ Select from 77 fonts for your text watermarks. - Create your own watermark or use our included examples. Examples are both text (names, dates, etc) and graphic (signatures, logos, etc.) watermarks which can be used immediately. 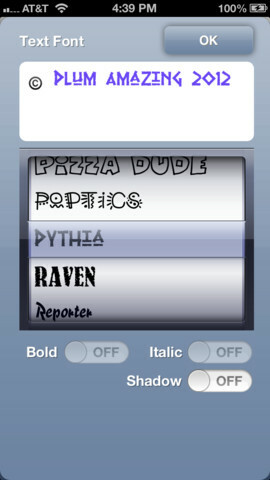 - Create your own text watermarks using any the iPhone fonts directly in iWatermark. Or you can import your own graphic watermarks to expand the range of possibilities. These can be signatures or logos which are made on your computer and sent over via email, received on the mobile device and then saved in the photo library. 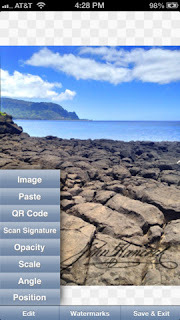 - A new type of graphic watermark you can make in iWatermark is a QR code which is like a barcode. 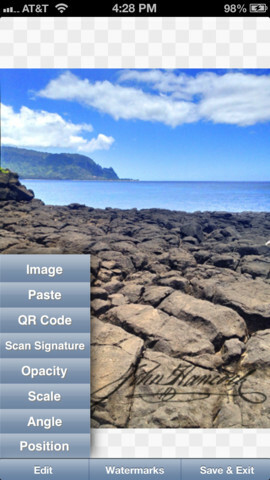 QR codes can then be read with a scanner or smartphone with the right app revealing the info you encoded. - Digitally sign your photos/artwork with iWatermark to claim, secure and maintain your intellectual property and reputation. - Build your company brand, by having your company logo on all your images. - Promote your company, name and website by using QR codes as watermarks. - Avoid the surprise of seeing your photos and/or artwork elsewhere on the web or in an ad. - Avoid the conflicts and headaches with plagiarists who claim they didn't know that you created it. - Avoid the costly litigation that can be involved in these cases of misuse of ip. - Avoid intellectual property squabbles. There's so many good reasons why you need iWatermark to protect your work, or show off your company brand in a unique and attractive way. COOL CONCLUSION: Using iWatermark, enjoy peace of mind displaying your photos and logos socially knowing that your own special mark claims your work as your own.